This antioxidant-rich moisturizer calms redness and deeply hydrates while repairing skin to create a healthy glow. As seen backstage in NYC Fashion Week. This cream…wow. The 1st time I put this on my face it felt like no other cream I’ve ever tried before (And I have tried many). It’s the definition of silky. I have suffered from Rosacea for a number of years and, as a result, am always on the hunt for the perfect moisturizer that isn’t irritating or oily. This is it! I love that I’m not putting harsh chemicals on my skin (and into my body). While I still have the typical rosacea redness it does not seem as bad as normal and I no longer have the unsightly little bumps that are often associated with it. So glad I purchased this! I used to live in California and my skin was always satisfied with whatever run-of-the-mill creams I could find, but when I moved to NYC, my face took on an alligator-like quality. 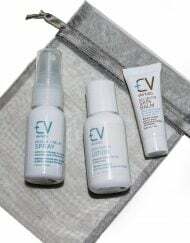 I have spent hundreds if not thousands of dollars trying to find something that makes my skin human-like and CV SkinLabs is IT!!! The face cream is the best thing I have ever found! 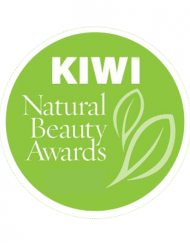 My skin feels soft, nourished and it has never looked better! Thank you so much for this delicious product! I am the “new 40” and have received compliments on my skin since using the product. I would recommend it for any age and any skin type. Best moisture I’ve used without the harmful ingredients in most cosmetics. amazing for dry irritated skin! Excellant for treating red irritated and painful rosacia.Almost immediate relief. Developed by researchers trying to help cancer patients with topical skin damage from chemo and other cancer treatments. I have not experienced any negative side effects on my very sensitive skin. This is a long awaited answer to my prayers. What a great combination – This week when giving a facial at Living Well Cancer Center I mixed your Calming Moisture for Face with some melted Manuka Honey for a very hydrating and calming mask. Calmed my clients red face down and her skin was glowing. Didn’t even need moisturizer. Put on a sunscreen and a very happy lady was bouncing away. Even got a email and call that night about how much she enjoyed her facial and how soft her skin was. Thanks for developing such a great product. This is the best product in the market – it immediately took the red away! Lasers age and damage your skin. After one, in the hands of a board certified expert dermatologist, my skin was ruined. Products exacerbated my side effects of dryness, dermatitis, rosacea, hypersensitivity. Your calming moisturizer has been great in that it does not provoke all of that and gives my skin a real chance to heal now. I tried the Calming Moisturizer and it felt fantastic on my skin. Immediately had a lovely glow, it was smooth and my skin felt and looked amazing! I learned it’s full of antioxidants and absolutely wonderful for my skin regardless of the fact that I don’t have problem skin. Everyone can use the Calming Moisturizing cream! I waited to use this specifically after I did a peel. My skin was on fire because I had used a new brand. I have to say without any doubt that my skin was IMMEDIATELY calmed by this cream. Calming Moisture is a wonder. It works! It was like I put out a fire. Not only did it calm my skin but it took away the redness too. I was in shock because I have never seen a cream that did this before. This is one I highly recommend for anyone with very sensitive skin. I am in love with this cream. It’s amazing. 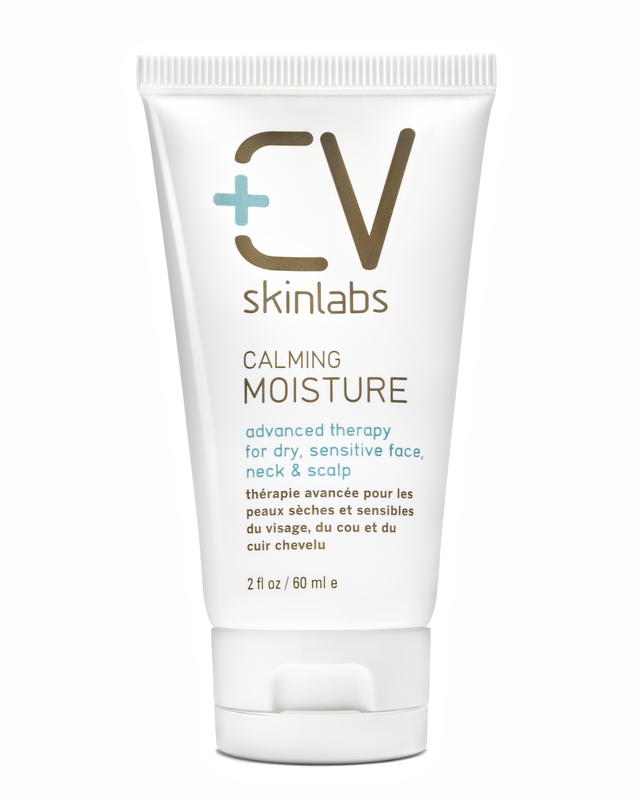 I LOVE the CV Skinlabs Calming Moisture. It’s the perfect moisturizer for my face – it’s not greasy or oily, and feels really hydrating. It is fantastic under makeup. And the fact that it’s free of chemicals and parabens makes me feel great about using it! 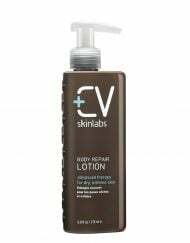 I am thrilled to have found CV Skinlabs product line. Your Calming Moisture cream and Rescue Relief Spray have been game changers for me and have helped my skin to feel soft, smooth and healthy, even during the cold, dry, stressful New York winters! 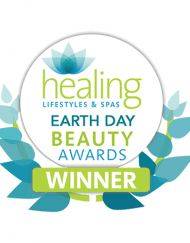 I had suffered from extremely sensitive skin my entire life and between seasonal changes, allergies, menopause and stress, it had been an ever changing challenge to keep my skin moist and rash-free without the need for steroid creams or harmful chemicals. CV Rescue Relief Spray and Calming Moisture have become a treasured part of my daily routine. Each day begins and ends with that relaxing mist on my face followed by the supple and amazingly light calming moisture. Thanks to CV, my red rashes and dry, chapped skin are distant memories. I won this product as a gift from a Shecky’s event and have been using the moisturizer for two months. This is a gentle moisturizer, it leaves skin soft and is not greasy. I would highly recommend this product. AMAZING! My skin loves this product. I have normal somewhat sensitive skin but its such a great quality product and feels so nourishing! I am currently pregnant and my skin is not reacting the same way it did before I became pregnant, so I have been looking for a safe alternative to use while pregnant, but still effective at providing what my skin needs. I love how my skin feels even hours after use and I can see a noticeable difference in the redness and irritation. This is the best lotion I’ve ever used! My skin instantly loved it when I put it on for the first time. I had gotten a sample tube from an event and had to immediately order some. I’m an over all very “low maintenance” person and I don’t usually look for sensitive skin products but because I got to try it I won’t use anything else! Highly recommend this for all skin types. Your skin will love you! Amazing! I use this as a facial moisturizer and on my hands in combination with the balm. Will be a lifetime customer! My skin is very sensitive and I get rosacea so it’s hard to find moisturizers that are chemical free and that really work. The texture is smooth and light yet it deeply hydrates without clogging my pores or feeling greasy. I’m grateful I finally found a nourishing moisturizer that that does not irritate my skin. 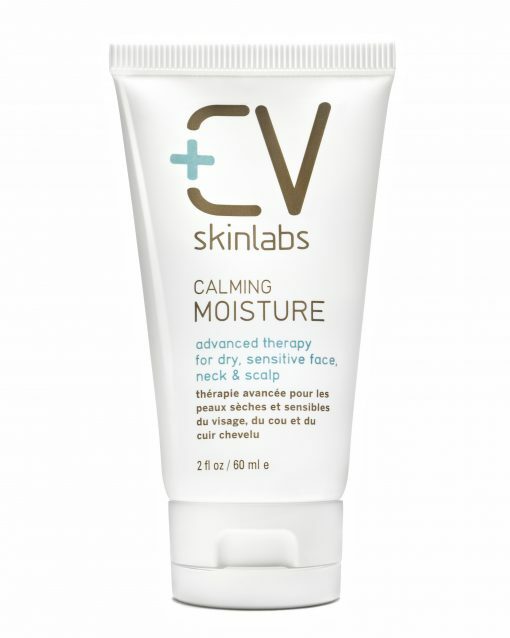 CV Calming Moisture cream is a home run! I just wanted to THANK YOU so very much for your WONDERFUL moisturizing face cream!! My skin was in bad shape being extremely dry, irritated, sensitive, blotchy, and red from chemotherapy treatments for breast cancer. I found your website while searching the internet for help regarding my now very fragile skin. It broke my heart to see my skin on my face change and I really didn’t want to leave the house because it was in such awful shape! It’s surprising that they tell you all about the many side effects you can get from chemotherapy but fail to mention how drastically your facial skin can change. As I said before I thank you and God for helping you create this fabulous face moisturizer that SAVED and is RESTORING my skin back to its original state!!! I am looking forward to continue using the Calming Moisture daily and await your facial wash which I understand you are in the process of trying to create. I know that will be great too. God bless you. I would give this 6 stars if I could. Extremely calming, soothing and moisturizing. I used this after a dermatology treatment on inflamed skin. This was a life saver. I absolutely love this product. I have been using it for about 2 months now and my face has never looked or felt so good. I have tried many moisturizers in the past and this product by far surpasses all of them. I have sensitive and dry skin and also a mild case of rosacea. The Calming Moisture soothes my skin and leaves it looking radiant and glowing. When I use the product religiously, my skin actually feels as if it is breathing! I also love the consistency of the cream and how easily it spreads across my skin when I apply it. 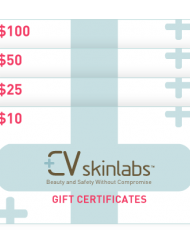 Hello everyone at CV Skinlabs! A few years ago I learned about you, but didn’t order product immediately. I’m not sure why I waited – I was drawn to the purity of your products and the story behind their development, but not a cancer patient. Well I’m here to say your product is fantastic! Within 2 weeks of using the face lotion as a replacement for my “other” moisturizer, my skin was baby soft, radiant and blemish free! A true blessing to 48 year old skin! My friends are asking if I’ve had work done. (I’m truly afraid to try some of the skin treatments available for aging skin.) Of course, I share my newfound, non-toxic secret with them! Thanks for the amazing work you do for people with serious conditions and provide healthy alternatives to all of us, even to those of us blessed with good health. Your work is a gift to us all! With this moisturizer my skin both glows and looks youthful. I have not had this many compliments on my skin since I was a child. By far the best product on the market and worth every penny. I have always had oily combination skin but developed a bad case of rosacea about five years ago. 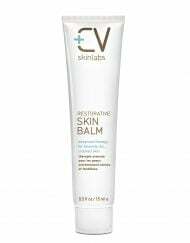 The CV Calming Moisture is so refreshing and rejuvinating and makes my skin look and feel amazing. I first used the moisturizer after a mask but now it is my go-to moisturizer after washing my face in the evenings and mornings and will be an intregal part of my skin care regimine. I feel very lucky for finding such a gentle, effecitve moisturizer. good quality product. I’ll buy it again. Always a good buy for people with eczema. It says it helps with moisturizing the face, but meh. I use this on the trouble spots on my body. To my absolute delight- after applying the Calming Moisture to a dry cracked area on my thumb cuticle, the lotion actually “pulled” the soreness right out! It was almost instantaneously! I use the Calming Moisture as my body lotion in the winter time. My skin soaks it right in. Also, it is totally perfect for diaper rash and the heels of your feet. Hats off to CV!